I saw a question in a forum the other day where a site owner wanted to list the categories for a post on the page. Seems like it should be simple, and it is if there is just one category. But if there are multiple categories, it gets tricky. I recently decided to split up a category. I had a general “posts” category that represented all non-video text posts. I sometimes posted special features or commentary under this category. And recently I’ve been posting news. So I created a “news” category and added that to all of the news posts. A category list on your WordPress site can something be less useful than you think. With titles, images, text and more displayed, only a few can fit per page. Even with good use of excerpts or the more block, you can sometimes have many pages of content, when all you really want is a list of all of the posts in a category. 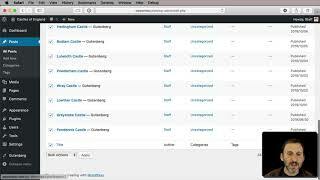 You can use the bulk selection feature in WordPress to add a category to multiple posts at the same time. This is useful for when you create a category later on, and need to apply that retroactively to old posts. You can easily select all posts, or only specific ones. Unfortunately, this does not work for removing categories.